Let’s talk a bit about Belgium, the country where I grew up. The Belgian countryside, more specifically an area called “Hageland”. Named after the hedges which used to delineate fields. Nice place to live. If you like very small towns where everybody knows everybody. Where you can actually meet other people outside home and work. Where in our local pub, the music is not too loud to talk to your friends. And where they actually know how to tap a pint of beer. Where you’re only a stone’s throw away from the quiet of the countryside. It’s a good place for a relaxing bicycle ride among the rolling hills in the countryside. This area was shaped by the Belgian Dream. The saying goes that Belgians are born with a brick in their stomach. With a dream of building your own house on the countryside, with a nice large garden. It’s a bit comparable to lifestyle blocks in Auckland, but in a smaller version. The result is a very peculiar settlement pattern. Let’s have a look at a couple of screenshots from Google Earth. 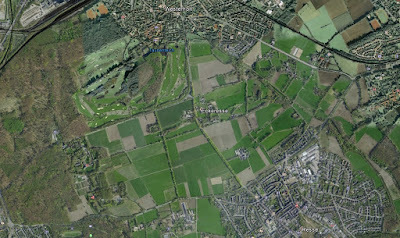 So we have a few paddocks in the north of the Ruhr area in Germany, one of the largest conurbations in Europe. And a few paddocks in the north of Belgium. What’s the difference? The difference is the roads. The term “rural road” doesn’t mean quite the same as it does in a lot of other places. In most places if you look around on a rural road it looks, you know, rural. Most of our rural roads tend to look a bit… urban. Look again at the satellite images. Even though the first one is right next to an urban area, the roads in that patch of paddocks are clear. 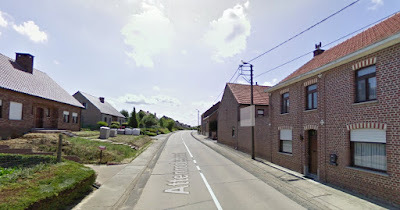 Belgium on the other hand is famous for it’s so called ribbon villages (that’s “lintbebouwing” for you Dutch speakers). And you can hear all the people lamenting we have run out of open space. They didn’t move in here to live on an urban road after all. But the open space is still there, hidden behind those houses. So how did we get there? In 1777 Joseph de Ferraris had the area of present-day Belgium mapped. Here is a small piece of that map. 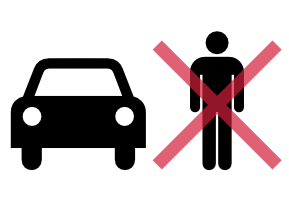 I drew the red line, more about that later. There’s two villages on this piece of map. Meensel in the middle, and Kiezegem in the top left corner. The area was covered with farmland and forest. That was a long time ago. But you can already see how the streets are dotted with what probably were farms. One thing which didn’t change much is the street network. We got one new street since then. 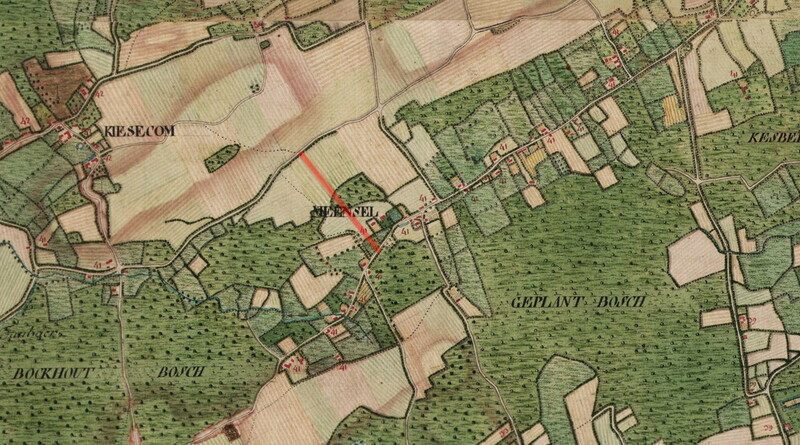 The red line, which connected Meensel to the new town hall after it was built in 1824. 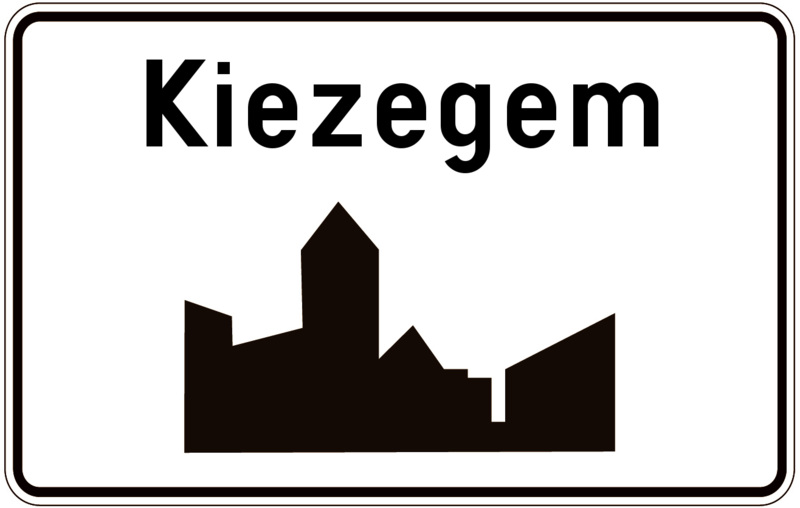 It continues to Kiezegem on what was back then just a track trough the paddocks. Then where to build the new houses? Building a few small streets to put a few houses together in a village is a bit of a taboo. That’s something for those dreaded suburbs. And zoning is for wussies. So as the village grew, all new houses were just added to the ribbons radiating away from the centres. And the government happily subsidized this with its “utilities to everybody” policy. I marked the ribbons on the map. 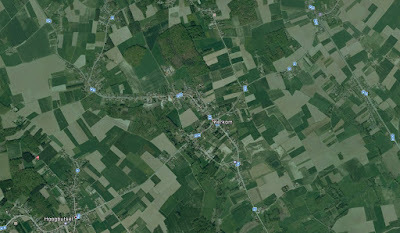 Look how they radiate from the villages, which I encircled in blue. If you stand in the backyard of your house, you have your view over the surrounding countryside. People like that. Now, the colours. 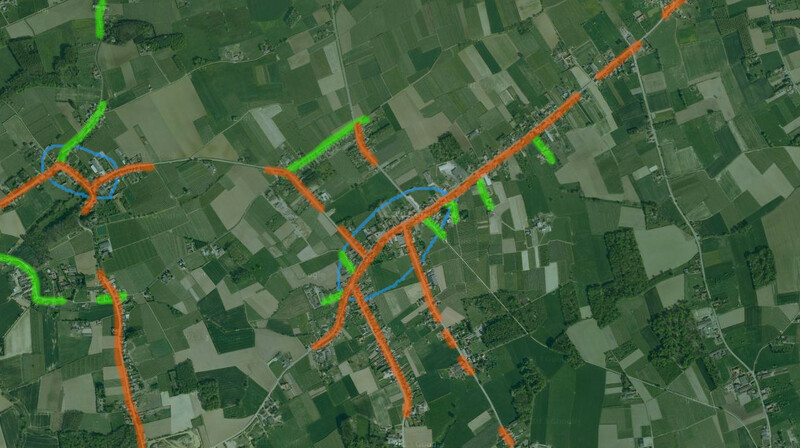 Orange is for the roads connecting neighbouring villages or towns, which therefore get most of the traffic. And look, almost everybody lives on the orange stretches. Green are the lucky ones. They live on the quiet streets with only the local traffic. The thing is, there’s not much of them. Most people get all the longer distance traffic going past their homes. This pattern of ribbon villages changes the answer to seemingly simple questions. For example: what is a village? The usual definition is that small blob of houses, usually a church, and maybe a few bussinesses. You can drive through a village. It starts and ends, and in Europe there are usually signs telling you where. Figuring out where to put that sign should be easy. Just walk until you see fruit trees, or barley, or sheep—something else than buildings. And put the sign down. Not here. You keep seeing house after house. It’s going to be a long walk with your sign. Maybe you noticed the different colours of the sodium lamps used for street lighting. How it changes from the orange low pressure to the pale yellow high pressure ones. That’s where the end of the ribbon was when the lamps where installed. You usually see the signs a bit further up the street, as an vestige from a time when the ribbon still ended there. Sometimes a council still moves the signs up the street, in a desperate attempt to pretend they still make sense. Few people still know the actual meaning of the signs. Tip: it’s not “this is where you have to slow down to 50kph”. Speaking of driving here. That also has its peculiarities. 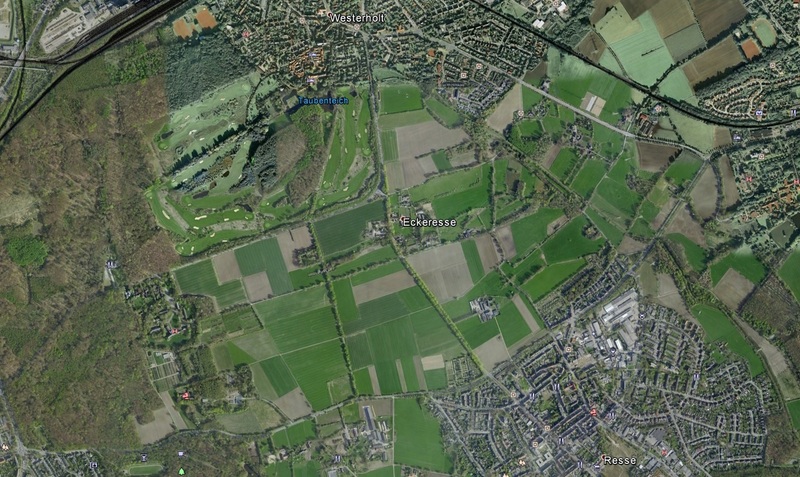 Imagine you drive from top left corner of the map to Leuven. You would follow the street towards the middle. The area you just drove through is home to mostly fruit trees and corn. And maybe 1,000 people. But a lot of them live along the street where you’re driving. That ribbon there is over 3 km long. We are in the weird situation that even though we are on the countryside, we are driving on urban streets almost all the time. As a comparison, to the south, the town of Tienen is roughly 3 km across, and home to more than 20,000 people. But it’s all the same. Another of those residential streets. A lot of people have long forgotten what the term “rural road” means. Another term which has lost its meaning is cut-through traffic (“sluipverkeer”). Going parallel to the main roads via residential streets. There is no main road anymore. On street level it seems you’re still in the city of Leuven for another 10 km. But actually you’re driving in the middle of paddocks. 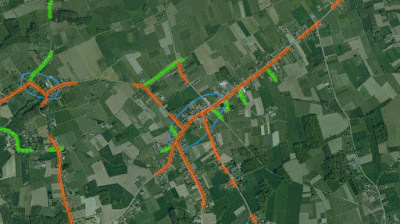 In an ideal world only the blue parts—the parts actually in a village or town centre—would be built up. So naturally, to get around in our spread-out villages, we need cars. For parents it can at times be annoying to drive the kids to the soccer practice and the music school and the youth movement and so on. And back. But that’s ok, we Belgians are avid petrolheads dieselheads after all. Getting to work in the morning, there’s the real challenge. Having a commute of less than half an hour is a rare luxury. More than one hour is common. But that’s a sacrifice people are still willing to make to live here. The ribbons, they’re still growing. It’s still a nice place to live after all.